Josonia Palaitis has known High Court judge Justice Michael Kirby for over 20 years. 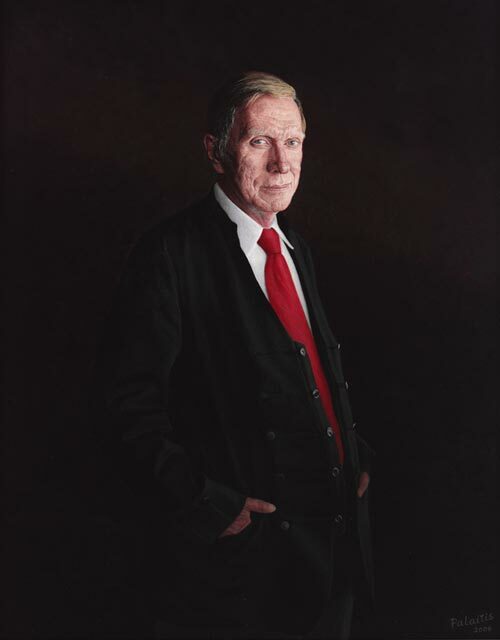 In fact, she painted him for the 1983 Archibald Prize though the portrait was not selected as a finalist. About a year ago she received a letter from Justice Kirby, who had seen her work at the National Portrait Gallery and wondered what had become of that 1983 portrait. They got talking and Palaitis suggested they have another go at the Archibald. Born in Sydney in 1949 (both her parents were illustrators), Palaitis obtained a diploma from the National Art School in East Sydney in 1972 and a BA from City Art Institute. She has been a finalist in the Archibald Prize on five previous occasions and won the 1995 People’s Choice for her portrait of Bill Leak. She won the 1994 Doug Moran National Portrait Prize with a portrait of her father and was commended in 2002 for a portrait of her mother. In 2000 she was commissioned by the National Portrait Gallery to paint prime minister John Howard and his wife Janette, and also was chosen to paint the Childers Memorial Portrait of the 15 backpackers who perished in the hostel fire in 2000. Her work is held in many collections including the National Portrait Gallery, the National Library of Australia, the Tweed River Art Gallery and the Catholic Archdiocese Collection.